Yesterday I bought a crepe-with-banana from one of the crepe-stands at the corner of rue Odessa and rue Montparnasse. Just banana? Or banana and Nutella? the lady behind the window asked. Just banana, thanks. She made the crepe from scratch, and when the pancake turned pale gold, she sliced a ripe banana and scattered it on one half. Then she grabbed the jar of Nutella and made to open it. No, no Nutella, I reminded her. Sorry, she said, I am so used to it, everybody orders banana with Nutella. I said, non, I don't like chocolate very much. Oh really, she said, her tone astonished, that is just bizarre. It isn't just her, other people have said it too. I don't detest chocolate, but I don't go mad for it. I just don't crave it or have longings for it like some people I know. I've even passed this bizarreness to husband, so sometimes, months can go by without there being any chocolate at home. And since we are on this subject, I would add too that I don't like cheesecakes much, nor angel food cake- the former for being too rich, the latter for being too airy and pointlessly sweet. But I like meringues and pavlovas in moderation, and chestnuts, well, I love very much, in my opinion there isn't such a thing as a too-sweet marron, even the glaced ones. I also abhor anything with cinnamon in it, so that rules out most American- influenced apple confections, donuts and fruit cakes. Come to think of it, perhaps I really am a bit strange. But there may well be a cure for my affliction. See, there's a Maison du Chocolat near our apartment. Everytime I walk by it I see that it is full of customers, groups of tourists even have their pictures taken in front of the store. I've gone inside too but did not feel the magic. Until one day when it was raining, and I ducked inside for some warmth. My eyes were attracted to their beautiful eclairs, in particular their caramel eclairs with a single glaze of caramel piped smartly along its length, reposing elegantly along one window. 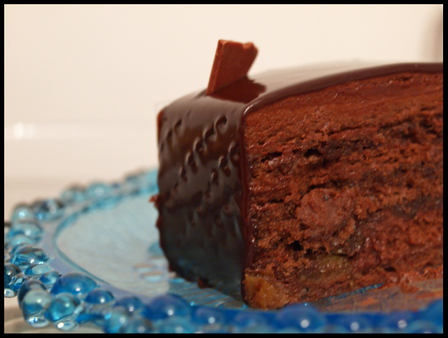 Alongside, a trio of chocolate cakes, all covered in a brilliantly smooth chocolate mirror. I brought home a piece of cake and a caramel eclair. The eclair was fabulous, it was piped full of caramel cream, sweet with a burnished edge like the taste of broken shards of burnt sugar. But the cake, well, it was equally riveting, so much going on in one confection- the mousse, the glaze, the boozy raisins-. it was practically a chocolate assault weapon. We marveled at the richness, the sophisticated finish and the absolute deliciousness of really good chocolate. It wasn't quite an epiphany, but I could sense the curse lifting. Looking at my archives, I surprised myself with how few sweets we ate at home last month. No baklavas, no macarons, no pretty pastries. We ate a lot of gariguette strawberries in the second half of March but in terms of baked goods, all I could dig up was these pictures taken on a Sunday stroll along Marais. 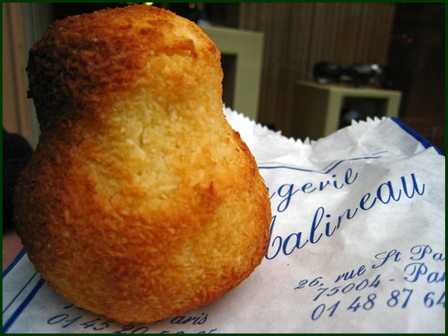 Being in the Jewish quarter, the shops are open on Sundays, and Boulangerie Malineau stood out for their offbeat offerings. Robyn had blogged about their psychedelic marshmallows. My fourth sister, when she was in Paris last weekend, loved their fruity cookies baked in cute mouse shapes. Malineau seem to do biscuits, biscottis, scones and rustic, unadorned back-to-basics items really well. The range available on Sundays seem to be more comprehensive than weekdays though. The cake above, they labelled as a congolaise. It looked so cute and homely, and the name was so exotic, so even though we didn't know what it was, I had to try it. 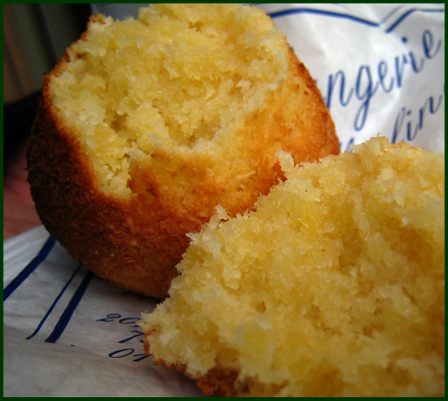 Congolais is, as it turned out, a type of coconut cake. Buttery coconut cake. I broke it in half and discovered that the crisp nutty crust gave way to golden interior packed with sweet shredded coconuts and moist buttery cake crumb. It was like eating a Bounty advertisement, only of course way better and elementally satisfying. After that, I saw other boulangeries' versions of congolais, and had not been tempted by any of them because in comparison, theirs look so pallid and unappetising. The second thing that we liked is a seemingly ordinary cake, baked in big pound loafs and sold by the weighted slices. I've never seen cake tinted in these shades before, in pale pastels, so much more subtle than the usual food colorings, and it was like this too in the eating. 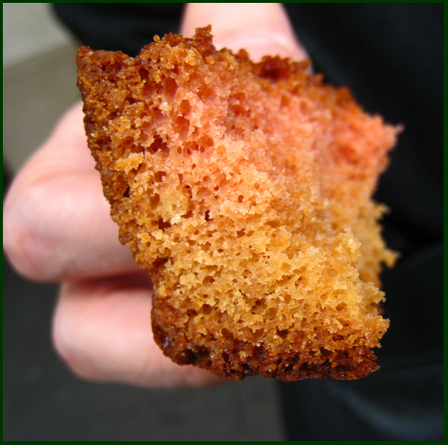 We could taste butter, and fruit flavours in the pleasingly open-pored textured cake, quite novel for us. Typing this in the middle of the night with the long weekend ahead, I think to myself, a repeat visit to Malineau is in order.